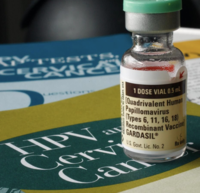 HPV vaccines protect against cervical cancer in young women, especially when the women are vaccinated between the ages of 15 and 26, a new Cochrane Report finds. 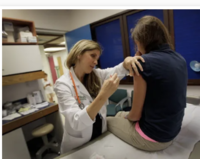 The report's authors, who examined evidence from 26 previously published studies of more than 70,000 women, also found no serious side effect risks associated with the vaccines. 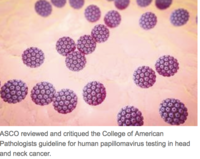 "Today's approval represents an important opportunity to help prevent HPV-related diseases and cancers in a broader age range," said Peter Marks, MD, PhD, director of the FDA Center for Biologics Evaluation and Research, in a statement. Overstretched resources in the field mean that the public are being left unprotected, according to the Royal College of Nursing (RCN), which launches a report on Monday as sexual health experts warn that services are at “tipping point” due to budget cuts. 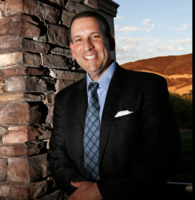 An analysis from the Kaiser Permanente Northern California cancer registry showed that women with head and neck cancer are less likely to receive intensive chemotherapy and have an inferior outcome compared with men. "We’re looking to empower women, to create a paradigm where women are able to monitor their own health.” founder of Syrona, Chantelle Bell. 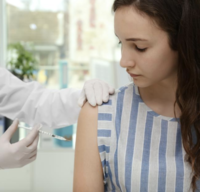 Does implementation of an intervention to improve primary care professionals’ human papillomavirus (HPV) vaccine communication lead to increases in adolescent human papillomavirus vaccination? Trends of two HPV-associated cancers in Massachusetts: cervical and oropharyngeal cancer. 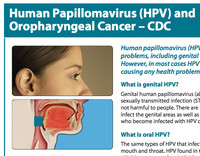 The rising incidence rate of oropharyngeal cancer in men and the decreasing, but relatively high, incidence rate of cervical cancer in women highlight the need for further screening and prevention by HPV vaccination in Massachusetts. Your health system has the power to make a lasting impact on human papillomavirus (HPV) vaccination and help reduce the HPV cancer burden. HPV cancer prevention starts with your health system.We invite your organization to join the national “We’re In” movement to prevent HPV cancers and pre-cancers. By instituting system changes to improve HPV vaccination, your health system can reduce future suffering, lower costs associated with treatment, and ultimately help save patients’ lives. You have the power to make a lasting impact on human papillomavirus (HPV) vaccination and help reduce the HPV cancer burden in your community.HPV cancer prevention starts with you.Your recommendation is the number one reason parents decide to vaccinate. You have the power to reduce the incidence of human papillomavirus (HPV) cancers and pre-cancers among patients in your care. HPV cancer prevention starts with you. Vaccinating patients with the HPV vaccine can prevent future suffering and may save patients’ lives. Strongly and clearly recommend HPV vaccination to all eligible patients.